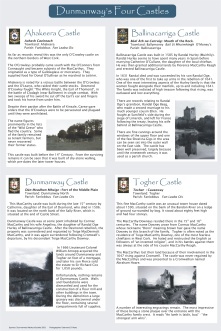 Since the foundation of the Historical Association in 2003, the members have been researching, collecting and recording information regarding the Dunmanway area and its surrounds. Now in 2010 there are Posters and Folders in the Heritage Centre where the information has been recorded. The public are very welcome to view these Posters and Folders. There are 9 posters altogether containing photographs and relative information. Archaeology - Stone Circles, Tombs, Ringforts, Graveyards, Fulachta Fiadh etc.